Unlike traditional umbrella designs, such as drape or market, wall mount umbrellas are just that: mounted to the wall. 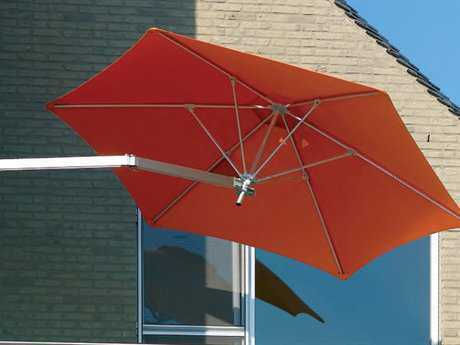 The umbrella is mounted with a wall-hung bracket with an extending arm, allowing the canopy to be placed over the desired area without taking up floor space for a pole and umbrella base. PatioLiving offers an extensive selection of wall mount patio umbrellas from top brands such as Luxury Umbrellas. Wall mount umbrellas are ideal for smaller patio spaces, or spaces where you do not want an umbrella pole to obstruct your view. Like traditional umbrellas, wall mount umbrellas are a functional design element, allowing guests to sit outside while being shaded from the sun. They are available in a variety of styles to match any outdoor aesthetic. 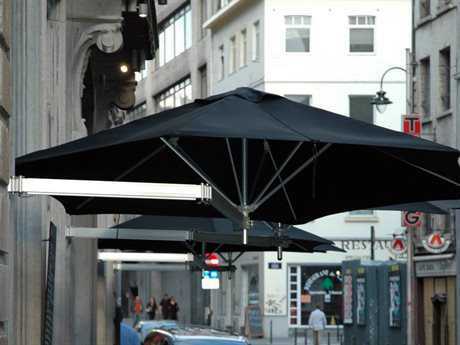 Wall mount umbrellas can be placed over a seating or dining area to provide shade. While they can be placed upright like a traditional umbrella, some models can be tilted to move with the trajectory of the sun, allowing for shade throughout the day. Because the umbrella pole is attached to the wall, rather than resting on the ground in an umbrella holder or base, wall mount umbrellas take up less space and let you fit more furniture or people on your patio. Without an umbrella pole, you are not limited to an outdoor dining table with an umbrella hole in the middle. Wall mount umbrellas are also easy to store, as they do not require additional storage space. When not in use, the closed canopy folds against the wall, leaving your patio space clear. Wall mount umbrellas are available in a variety of colors, patterns and materials, perfect for customizing your outdoor entertaining space. Since these umbrellas need to be placed adjacent to a wall, they are ideal for shading doorways and seating areas close to the house. Large wall mount umbrellas can be used to shade a dining table without the need for an umbrella hole, and lets you enjoy your space without a pole obstructing the dining area. They also give you space for more patio furniture and patio decor. For more information about patio umbrellas, read PatioLiving's Patio Umbrella Buying Guide to learn more about patio umbrella sizing, construction, materials, and features.